Dissolved Phase Contaminants — The part of (VOCs-hydrocarbon) contamination which has dissolved/partitioned into a body of water (In our case – groundwater and typically petroleum based compounds). When hydrocarbon product is present in the dissolved phase in groundwater extraction wells, the contaminated groundwater must be treated. 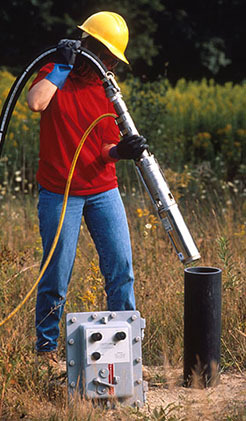 Geotech has the equipment for pump-and-treat systems. 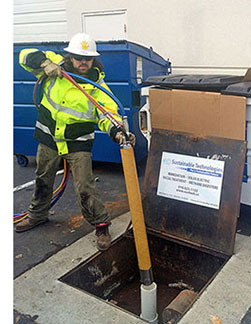 Pump and treat is a common method for cleaning up groundwater contaminated with dissolved chemicals, including industrial solvents, metals, and fuel oil. Total Fluids Extraction – The removal/recovery of groundwater (usually contaminated with dissolved phase contaminants) along with any free phase product; such as gasoline and groundwater contaminated with gasoline that has portioned into it. Chlorinated solvents could also fall into this category. 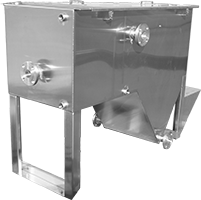 Total fluids recovery systems generally require LNAPL/water separation which may be difficult due to emulsification. Emulsification problems can be minimized by proper pump selection. Pneumatic remediation pumps that pump to the surface dissolved hydrocarbons, leachate and condensate. They are built to withstand highly corrosive fluids in harsh down-well environments. Geotech offers a variety of pressure transducers and controllers for groundwater monitoring, remediation pump control, landfill pump control, and many other applications. Auto-Reclaimer AR4 into a well. Electric pumps that pump polluted water to the surface for treatment. Treatment systems for the separation and removal of dissolved phase hydrocarbons from groundwater at the surface.